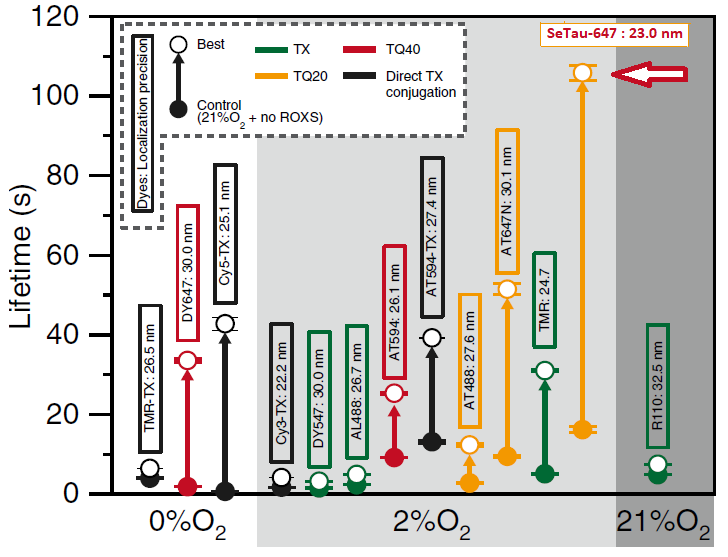 SeTau 647 (K9-4148) allowed for the observation of 12,000 frames in in-vivo single-molecule tracking experiment. The probe consists of the near-infrared squaraine dye Seta-640 (K8-1662) conjugated to two anthraquinone molecules via Lys-d-Ala-d-Ala peptides. 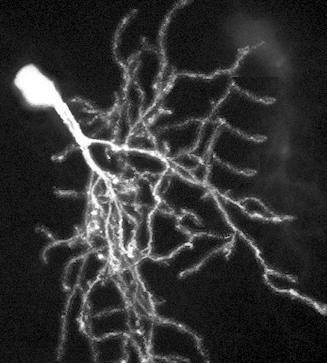 Cortical actin nodes were investigated using super-resolution and single-molecule microscopy techniques with SeTau 647 (K9-4148)-maleimide-labeled CoA. SETA BioMedicals will exhibit at the annual ASCB-meeting in San Diego, CA, USA on Dec 13 - 15, 2015. Please visit us at booth 423! 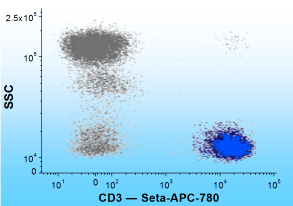 SETA BioMedicals, LLC has renewed the exclusive license agreement with PerkinElmer Health Sciences Inc. to provide dyes for their HTS assays. SETA BioMedicals produces, commercializes and licenses proprietary fluorescent detection reagents (fluorescent dyes, probes, labels, tandems, and standards) for biomedical applications. SETA BioMedicals also sells reactive Cy dyes (Cy3, Cy5, Cy5.5 and Cy7) at highly competitive rates. Please contact us for price quotations on other derivatives or bulk orders. These detection reagents can be ordered over the phone (217) 417 2160, via e-mail at orders@setabiomedicals.com or with our online shopping cart and are delivered the next day in the continental USA and within days at any other destination around the world. Novel, extremely bright and photostable probes and labels based on squaraine rotaxanes. These unique fluorescent reporters combine all desirable features of common fluorophores including high chemical and photochemical stability. Bright and photostable tandem-conjugates of APC, PE and PerCP with Seta dyes for flow cytometry and immuno-fluorescence applications. Next generation labels for proteins, oligonucleotides and other biomolecules with exceptional brightness and photostability. Fluorescence standards are utilized in the calibration and validation of fluorescence instruments, luminescence readers, and as fluorescence reference materials. The standard kits offered by SETA are ready and easy to use! 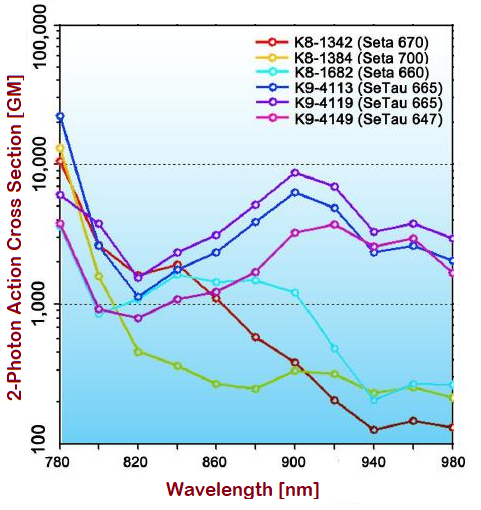 In a comparative study of 13 dyes, SeTau-647 (K9-4149 and K9-4148), a squaraine rotaxane dye, exhibited the best photobleaching performance in a single molecule application with an exponential lifetime of 105.8 ns (twice as long as the 2nd best dye Atto-647N). 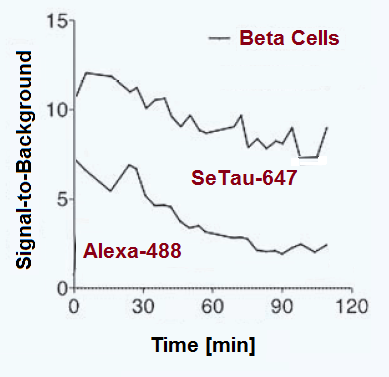 Squaraine rotaxane dye SeTau-647 outperforms Alexa dyes (Alexa 488, Alexa 568) in signal-to-background ratio and in vivo imaging properties. Compared to conventional cyanine dyes squaraine and squaraine-rotaxanes exhibit 10 – 50-times higher 2-photon cross-sections in the order of several thousand GM. 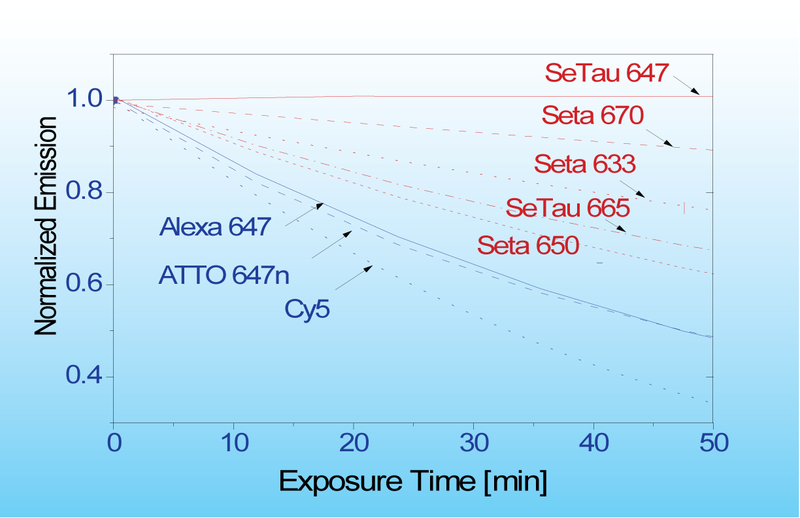 Seta and SeTau dyes are a class of extremely bright and photostable dyes for fluorescence imaging and are also well suited for STED and STORM applications. Our highly fluorescent squaraine rotaxanes exhibit high chemical stability in particular against oxidative reagents such as peroxides or ozone and therefore are excellent detection reagents for DNA and protein microarrays where the fluorescence signals of cyanine dyes such as Cy5 and Alexa 647 are strongly dependent on the concentration of ozone during post-hybridization array washing. 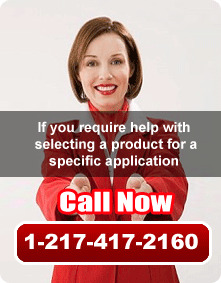 SETA BioMedicals offers free consultation on the use of SETA products for your application. Please call us at 217 417 2160.